On Sunday, February 17th, at 8.30 in the morning, the Mother of God In Her Czestochowa Icon went in Her “Life Mobile” to the town of Coslada, situated at the outskirts of Madrid. She stopped at a private school of Colegio “Mama Juanita” (Mummy Joanna), run by the “Cruzada Evangelizadora” (the Evangelisation Crusade). She was awaited by single mothers and children saved from abortion, the elderly from the care house and many inhabitants of Coslanda. The Icon was carried into a small chapel where prayer was going on. The meeting was attended by a group of Polish people who had the chapel decorated beautifully on the occasion of the visit of the Queen of Poland. There were Polish and Spanish flags and numerous baloons in white and red. Inside the chapel they placed a big slogan: “Mother, together with you we are open to life”. 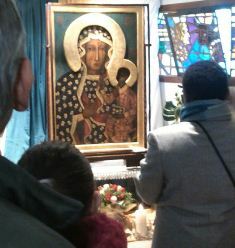 Next the Icon of the Black Madonna was carried in a procession to the parish of St. Peter and Paul. Around 300 people were waiting there. The veneration lasted till 4.45 PM. At 5 PM there was the next visit, this time at the church of the Holy Cross, which is being built now. It houses the relics of the Holy Cross, which are greatlly venerated. The icon was solemnly carried into the church and placed at the side of the presbytery. A large cross, placed at the central place behind the altar, dominated over Her. The crowd of the faithful, when praying, could remember the Golgota scene, where the Mother of Jesus was standing at the Cross. The vigil at the church of the Holy Cross lasted all night and finished with the solemn Holy Mass in the morning of the next day.